A New Hampshire-based organization founded by a formerly homeless veteran is running its second campaign in hopes of providing another 1,000 winter survival kits for more homeless veterans. Dysfunctional Veterans (DV), an organization devoted to fostering a veteran community and supporting veterans in need, is on a mission to raise the funds for 1,000 more winter survival kits before the end of the week. “Veterans don’t deserve to live like this. We want to help 1,000 homeless veterans get through the harsh winter with the necessities to stay warm,” DV said in a Facebook post this past November. Founded by former homeless Army veteran Mike Rivers, DV describes themselves as “a brotherhood and sisterhood of veterans rooted in sarcasms and the things that remind us we are not alone,” according to their Facebook page. DV is a committed supporter of the veteran community and related causes. They also help veterans through a farm environment at the DV Farm, which offers a support structure for veterans as they overcome challenges such as homelessness and addiction. Rivers’ own experience with homelessness inspired him to start the campaign for the homeless kits last year. “I was living on the streets homeless in Boston, from doorways to subway tunnels. It was pretty rough,” Rivers had told American Military News. Contributions can be made on DV’s online store, where those interested can pledge $50 for a full kit, $25 for a half kit, or $12.50 for a quarter kit. 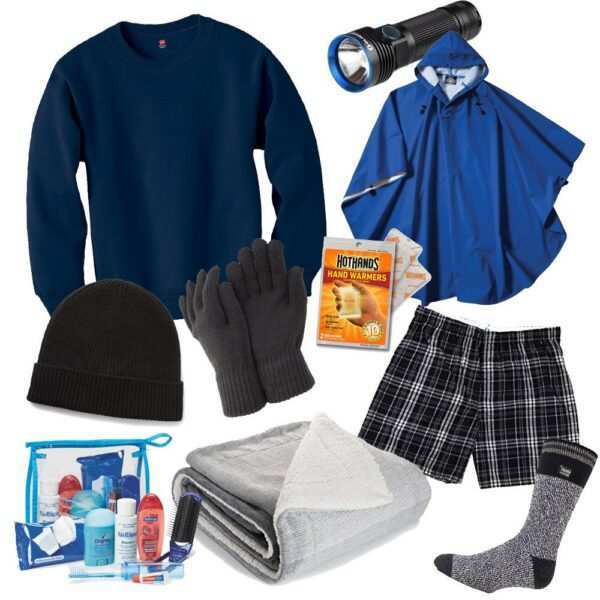 Each kit contains a sweatshirt, blanket, hat, gloves, thermal socks, underwear, hand warmer packs, hygiene kit, poncho, flashlight and assorted snacks. Contents of the winter survival bags for homeless veterans by Dysfunctional Veterans. (Photo courtesy of DV Store). “We want to give the most people the most things we know most of them will keep,” Rivers had said. The items are designed to be used by men or women – and kits designed with female-specific items will also be handed out. The items are also lightweight and easy to carry around. Rivers plans to connect with other nonprofits in the area, such as the Pine Street Inn and the Court Street Shelter, to seek advice on helping the homeless veteran population, and learning of other problems they may be facing. The kits aren’t the only thing DV will be handing out to the homeless veterans. “If they’re interested in coming off the street, we’ll have a list of resources and advice on what they can do,” Rivers had said. “DV wants to help homeless veterans across America stay warm this winter. Please help us reach our goal of supplying vets on the streets with 1,000 winter survival bags. You can pledge as little as 1/4 a bag or multiple bags,” the kit’s description reads. “The number of homeless veterans is on the rise. In 2017, the number ticked up for the first time in seven years to 40,000. Many of these homeless vets live in areas affected by extreme winters, with sub-freezing temperatures and feet of snow,” the description noted. Approximately 40,000 veterans are homeless, while another 1.4 million veterans are at risk of homelessness “due to poverty, lack of support networks, and dismal living conditions in overcrowded substandard housing,” said the National Coalition for Homeless Veterans, citing U.S. Department of Housing and Urban Development (HUD) estimates. Rivers hopes to expand the campaign if it garners enough support. “If this is successful and I can get the manpower and volunteers, I don’t see why we can’t expand to other cities,” he added. This article was originally published in November 2018 and was re-published with changes to reflect timeliness in February 2019. The original article was edited to reflect that the organization is raising the funds for 1,000 homeless survival kits before Veterans Day and will distribute them in December.